When Tris Prior turns sixteen years old, she must take an aptitude test and choose a faction to live out the rest of her life in. Her society is divided into five factions: Dauntless (the brave), Erudite (the intellectuals), Abnegation (the selfless), Candor (the honest), and Amity (the peaceful). For most youth, the decision is clear after taking the aptitude test, but Tris is different. She has an aptitude for multiple factions. She is torn between family loyalty and what her heart really wants. Ultimately she follows her heart, and ends up with the Dauntless. Dauntless training is brutal, and Tris wonders if she will even survive the initiation. Tris makes both friends and enemies amongst the new initiates, and she soon finds herself entangled in a web of danger and deceit. 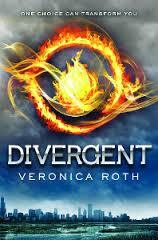 Tris eventually uncovers a plot that alters everything she has ever known about herself and the faction system. Soon it is not only her life that is threatened, but the lives of everyone she holds dear. The writing style and story development in this book felt weak. I had trouble relating to the characters and did not become invested in their troubles. It seems rather absurd that the majority of people in a society would display an aptitude for only one faction. The factions are so generalized that it is difficult to pigeonhole people into just one, especially when they may be raised in an entirely different faction than the one they end up in. Tris is supposedly special because she has more than one strong personality trait, and she is considered dangerous because her existence could upset the balance of the factions. It is unclear as to why this is so important. Tris also has the ability to manipulate Fearscapes, which again seems like a pointless technology to be using in the first place. This book may be of interest to teens who enjoy dystopian novels, but it is not a personal favorite. Reader’s Annotation: Tris is different. In a world of order, different is dangerous. Describe Tris’ freefall into Dauntless headquarters. Describe the five factions and their purpose.